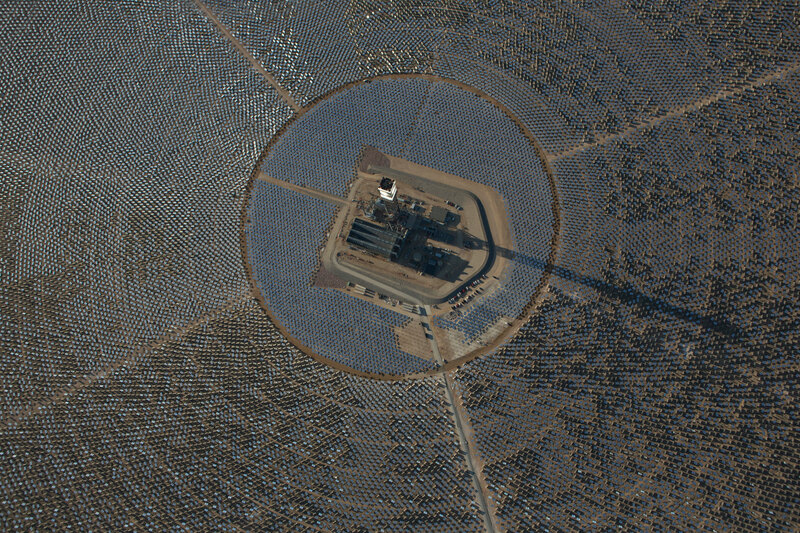 IVANPAH, CALIFORNIA, APRIL 05 2013: An aerial view of Tower 1 and its heliostats at the Ivanpah Solar Power Facility. The top of Tower 1's is "lit" as steam blow tests are in progress. Located in the Mojave Desert 40 miles southwest of Las Vegas, The Ivanpah Solar Power Facility is a solar thermal power project, currently under construction, with a planned capacity of 392 megawatts, enough to power approximately 140,000 houses. It will deploy 170,000 heliostat mirrors spread over 4,000 hectares, focusing solar energy on boilers located atop three solar power towers, generating steam to drive specially adapted steam turbines The project, developed by Bechtel, will cost $2.2 billion and be the largest solar farm in the world (photo Gilles Mingasson/Getty Images for Bechtel).